Bless Me Father DVD box set. The complete 3 series on 3 dvd's. DELIVERED FREE IN THE UK when you spend over £15. 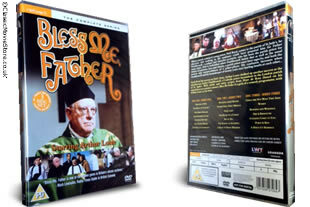 This 3 disc dvd set contains all 21 episodes of the late 1970s/early 1980s LWT Britcom based on the popular autobiographical novels by former Catholic priest Peter de Rosa. Arthur Lowe stars as Father Duddleswell, the wily pastor of St Jude's parish in suburban London, who gives keen young priest Father Neil Boyd (Daniel Abineri) on-the-job training in the finer points of sustaining and supporting the flock. Tart-tongued housekeeper Mrs Pring (Gabrielle Daye) and domineering Mother Superior (Sheila Keith) add to the fun in this affectionate send-up of 1950s Catholicism. Episodes are: 'Baptism of Fire', 'The Bells of St Jude's', 'The Parish Bazaar', 'The Doomsday Chair', 'Father and Mother', 'The Tennis Match', 'The Seal of Confession', 'Blessings from Heaven', 'Father Neil's First Miracle', 'Fatal Lady', 'The Heart of a Curate', 'All at Sea', 'The Season of Goodwill', 'A Back to Front Wedding', 'Things Are Not What They Seem', 'Women', 'Beddings and Weddings', 'Fire and Brimstone', 'A Legend Comes to Stay', 'Porgy and Bess' and 'A Mixed-Up Marriage'.